At LastPass, we're always thinking of ways to better protect users and offer security options that allow users more fine-grained control over the protection of their stored data. 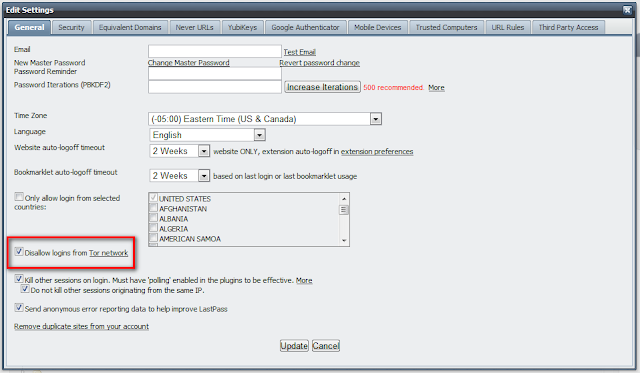 That's why we've added two new security options now available to LastPass users in the account settings dialog, which can be opened from the LastPass vault: the ability to restrict logins to selected countries and to disable access from TOR. This option is pretty straightforward - you can check one or more countries from which you wish to allow access to your LastPass account. When selected, you can only login to your account from an IP address that originates from the countries you permitted. The setting is not checked by default, but we do recommend using it as another layer of protection. 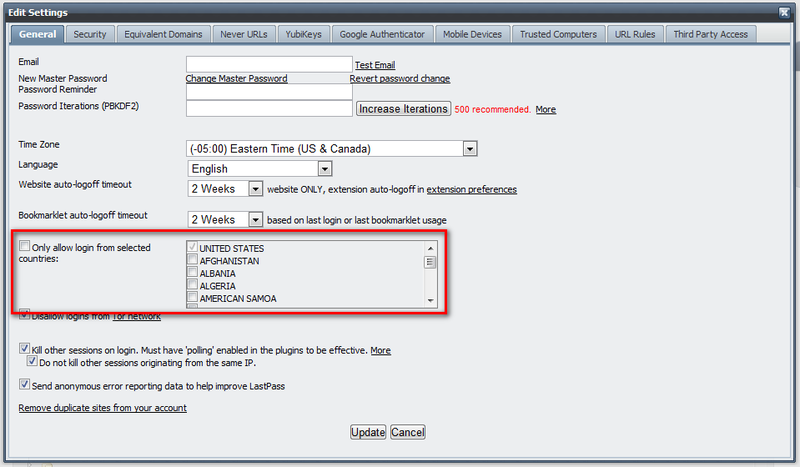 You can later adjust it if you'll be traveling and need to access LastPass abroad. If you're not familiar with TOR, it was originally developed for protecting US government communications but is now used for a variety of purposes, by normal people, the military, activists, and others for secure, anonymous use of the web. Because TOR has been associated with hackers who employ it to stay anonymous, and since the majority of LastPass users don't have a reason to use TOR, you can now disallow logins from TOR. We recommend checking this option if you never use TOR. The setting is not selected by default, but if you haven't logged in to LastPass via TOR over the last 30 days, you'll see the option will then be checked in the settings dialog. All LastPass users will now see the new security options in the settings dialog, accessible from the LastPass vault when you're logged in. If you're in a pinch and need to disable either setting, you will see an error message when logging in that points you to a URL where you can follow the steps to disable the setting(s) by using email. Remember, if you've enabled a security email address for your LastPass account, the disable emails will be sent there instead of your account email address. Using multifactor authentication with your LastPass account? You're already well-protected from potential threats that these settings are meant to protect you from, but it's worth enabling the settings for the added protection. If you're not using multifactor authentication, we highly recommend looking into the available options. There are both free and Premium multifactor authentication options that help you better protect your stored data by requiring that a second piece of data be submitted when logging in to your account.